Leading off today: Brentwood junior Bryce Harris finished with 30 points and 15 rebounds as the Indians earned a 72-58 victory over Elmont in the Richard Brown Nassau-Suffolk Challenge on Sunday. Brentwood, ranked second in the state in Class AA by the New York State Sportswriters Association, took charge with a 13-0 run at the end of the second quarter. Harris contributed five points to the decisive burst. "He's an incredible physical specimen, but this season he is learning what his strengths are," Indians coach Anthony Jiminez said. Jordan Riley added 14 points and Romello Wright had 12 for Brentwood against the state's No. 21 Class A team. Milestone on hold: Curtis senior Darnell Askew had 50 points when he was pulled from what would end up being an 85-57 victory over Cardozo in a matchup of PSAL boys basketball teams. His departure had less to do with a show of mercy than it did a prelude to a milestone. "He needed 51 points for 1,000," said Curtis coach Dwayne Archbold. "We have a home game on Friday so he's gonna do it on Friday." 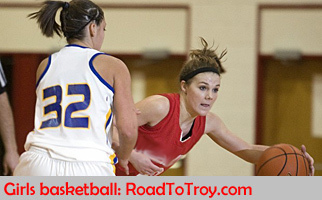 Askew also contributed 10 rebounds and two assists to the victory over the state's 25th-ranked Class AA team. The 20-point third quarter was his biggest for scoring. More boys basketball: St. Raymond, ranked sixth in Class AA, rattled off its ninth straight win by edging Monsignor Scanlan 73-69. The Ravens broke a 56-56 tie with a 10-2 run. Junior Gary Grant led the way with 16 points. • No. 11 Brooklyn Collegiate earned a 72-49 win over No. 14 Wings Academy in a big Class AA matchup of PSAL squads at South Shore's MLK Classic. Glen Anderson had 19 points and 10 assists, while Jaylin Anderson finished with 13 points and 13 rebounds. Looking ahead: New York Wrestling News plans to preview next weekend's NYSPHSAA dual-meet championships on Thursday but has dropped some quick thoughts already following Sunday's announcement of the 12-team fields in Divisions I and II. Stewart decides: Former McQuaid star Isaiah Stewart has made his college decision. The five-star recruit, who is in his second season attending La Lumiere School in La Porte, Ind., announced on ESPN that he would attend the University of Washington next fall. The Huskies are coached by Mike Hopkins, who began keeping tabs on Stewart while working as an assistant at Syracuse University. Stewart is the third New Yorker lured to the Pac-12 Conference by the second-year head coach, joining Hamier Wright (Albany Academy) and Naz carter (Bishop Kearney). 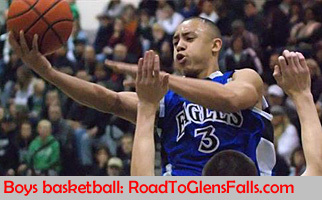 Stewart's final five also included Duke, Kentucky, Michigan State and Syracuse. Well, there they go again: It would be so easy for me to sit here in the comfort of my home office and ridicule USA Today ... so let's get started. For the second time in less that a year, the paper's website wrote a feature on the nation's scoring leader in boys basketball. And for the second time they got it wrong. -- unless Common Core math has changed the order of numbers -- Joe Girard III's 47 points per game this season is superior to the 45.6 points a game by Qwan Jackson, a junior in Milwaukee. The culprit once again is a reliance on third-party statistics. The reporter from the Milwaukee Journal Sen- tinel, a fellow Gannett newspaper, depended upon data available on MaxPreps.com to determine that Jackson was the national leader. The flaw in the methodology is that while MaxPreps is a great resource that I whole- heartedly endorse, the website depends upon schools to update their own results and statistics. My best guess is that maybe a quarter of New York schools choose to participate. It's plausible that the Milwaukee reporter has never heard of Girard despite his amazing accomplishments, including becoming New York's career scoring leader last season as a junior. But given his two-sport notoriety and the fact that Girard has committed to Syracuse University one would hope that an editor at USA Today might have had enough familiarity with high school basketball to remember the name and the attention Girard attracted by averaging 50 points a game as a junior. That alone would have been good reason to check on Girard's progress this season before putting the USA Today imprimatur on the story. National award: Veteran Williamsville North boys hockey coach Bob Rosen has been selected as this year's recipient of the American Hockey Coaches Association's John Mariucci Award, which is presented to a secondary/high school association coach who best exemplifies the spirit, dedication and enthusiasm of the legendary University of Minnesota coach. Rosen, who will be honored at a luncheon during NCAA Frozen Four week in Buffalo in April, is the winningest active hockey coach in the state with 483 victories. His Williamsville North skaters have won five state championships.